Though the Chinese Shar-Pei is the 134th breed recognized by the American Kennel Club, the dog breed has been around for hundreds of years. He was developed to guard, hunt, herd, and later, fight, and is known for his characteristic short, bristly coat, loose, wrinkled skin, and devotion to his family. Today, the Shar-Pei mostly enjoys life as a beloved companion. See below for complete list of Chinese Shar-Pei characteristics! His name means "sand skin," referring to his distinct, bristle-like coat. But that's not the only thing unusual about the Chinese Shar-Pei. He's a solid mass of loose wrinkles — folds of skin that make him look like he's wearing a bulky, oversized suit. His tiny ears sit atop a large, powerful head with a short muzzle and purple tongue. The finishing touch is a thick, round tail that curls over his back. To be sure, the Shar-Pei is an interesting-looking dog, and his looks alone are enough to prompt many would-be owners to choose this breed. But there's more to the Shar-Pei than his unique appearance. This breed is calm enough that he can live in an apartment. He's also an independent-thinking, sometimes aloof dog. His heritage as a guardian and fighting dog make him an excellent watchdog and guard dog — so much so that he must be taught not to overreact to people and animals he doesn't know. Early training is essential for the strong-willed Shar-Pei. He needs an owner who is able to establish leadership firmly and kindly, and he tends not to respect the owner who doesn't do so. He's a quick study, so training is generally easy as long as he's not showing his stubborn streak. Grooming is a cinch with the Shar-Pei. He's a naturally clean dog and frequent bathing isn't necessary or recommended. With all those wrinkles, however, he can be prone to skin problems so extra attention and care may be needed in that area. The Shar-Pei isn't as popular as he used to be, which is actually good for the breed. Increased popularity leads to increased breeding, especially by unscrupulous breeders who breed with no regard for health, temperament, and conformation. Unfortunately, that's what happened to the Shar-Pei in the 1980s. Responsible breeders have been working to regain the breeds' loyal, loving temperament, and to diminish or eliminate health problems. The Shar-Pei was once a guard dog and pit fighter. Today he is primarily a companion, though he retains fighting toughness. He can be aggressive toward other dogs or people, so it's imperative that he be socialized and trained from an early age. Due to his short nose, the Shar-Pei is prone to overheating. Keep him inside with fans or air conditioning during hot summer months. Like other short-nosed breeds, he tends to snore and wheeze, and makes a terrible jogger. Like the Chow, the Shar-Pei has a dark tongue. This is considered normal, even desirable, by dog show enthusiasts. Frequent bathing isn't necessary for the Shar-Pei, but when you do bathe him, dry him thoroughly. The wrinkles and skin folds are an ideal breeding ground for fungal infections. Though devoted to his family, the Shar-Pei can be willful and stubborn. He must learn right away who the pack leader is or he's likely to compete for the job. The Chinese Shar-Pei originated in the southern provinces of China where he was valued as a hunter, herder, guardian, and fighter. Some historians believe the Shar-Pei is an ancient breed, though there is no definitive evidence to prove this. Statues that look a lot like the Shar-Pei have been dated to the Han Dynasty (200 B.C. ), though these statues also resemble the Chow and Pug. Following the creation of the People's Republic of China, the dog population in the country was practically wiped out. A few Shar-Peis, however, were bred in Hong Kong and Taiwan. If not for the efforts of one man, Matgo Law, of Down-Homes Kennels in Hong Kong, the Shar-Pei might be extinct. Thanks to him, a small number of Shar-Peis were brought to the United States in 1973 and breed fanciers formed the Chinese Shar-Pei Club of America, Inc., in 1974. The first National Specialty show was held in 1978. The Shar-Pei was accepted in the American Kennel Club Miscellaneous Class in 1988, and recognized by the AKC in 1991 as a member of the Non-Sporting Group. Males and females stand 18 to 20 inches tall and weigh 40 to 55 pounds. The Shar-Pei is an alert and independent dog. He is extremely devoted to his family, but aloof with people he doesn't know. He is said to enjoy the companionship of people more than dogs, and he likes to be with his owner all the time. A calm and confident dog, he seems to develop an intuitive understanding of his owner or family. As devoted as he is, the Shar-Pei is also independent and strong willed. He is protective of his family — making for an excellent guard dog — and will respond to threats. Because he once was used as a pit-fighting dog, he can be aggressive toward other canines. Like every dog, the Shar-Pei needs early socialization — exposure to many different people, sights, sounds, and experiences. Socialization helps ensure that your Shar-Pei puppy grows up to be a well-rounded dog. Shar-Peis are prone to certain health conditions, especially skin conditions. Not all Shar-Peis will get any or all of these diseases, but it's important to be aware of them if you're considering this breed. Shar-Pei Fever: Also known as swollen hock syndrome, this condition manifests in the swelling of the hock joint (sometimes both joints), and results in reluctance to move, abdominal pain, vomiting, diarrhea, and shallow breathing. Dogs have one or more bouts of unexplained fever with temperatures as high as 103 to 107 degrees. The condition usually starts at 18 months, but can appear when the dog is an adult. The fever lasts 24 to 36 hours, and treatment includes reducing fever and pain. Hypothyroidism: This is a disorder of the thyroid gland. It's thought to be responsible for conditions such as epilepsy, alopecia (hair loss), obesity, lethargy, hyperpigmentation, pyoderma ,and other skin conditions. It is treated with medication and diet. Cancer: Symptoms include abnormal swelling of a sore or bump, sores that do not heal, bleeding from any body opening, and difficulty with breathing or elimination. Treatments for cancer include chemotherapy, surgery, and medications. Elbow Dysplasia: Similar to hip dysplasia, is also a degenerative disease. It's believed to be caused by abnormal growth and development, which results in a malformed and weakned joint. The disease varies in severity: the dog could simpy develop arthritis, or he could become lame. Treatment includes surgery, weight management, medical management, and anti-inflammatory medication. Demodectic Mange: Also known as demodicosis, this is caused by the demodex mite, which a mother dog passes to her pups in their first few days of life. (The mite can't be passed to humans or to other dogs; only by mother to pups.) Demodex mites live in hair follicles and usually don't cause problems, but if your Shar-Pei has a weakened or compromised immune system, he can develop demodectic mange. In its localized form, patches of red, scaly, balding skin appear on the head, neck and forelegs. It often clears up on its own, but even so, you should take your dog to the vet to prevent it from turning into the generalized form of demodectic mange, which covers the entire body and causes infection. Seborrhea: This is a condition characterized by flaky skin and a rancid odor. It is usually a secondary condition to allergy, infection, or other disease. Treatment includes bathing in medicated shampoo and treating the underlying disease. Pyoderma: Another skin condition, this is a bacterial infection of the skin, and is fairly common in the Shar-Pei. It can be a primary or secondary infection; the latter results from an underlying condition such as allergy or hypothyroidism. Pyoderma is treated with antibiotics. Hip Dysplasia: This is an inherited condition in which the thighbone doesn't fit snugly into the hip joint. Some dogs show pain and lameness on one or both rear legs, but others don't display outward signs of discomfort. (X-ray screening is the most certain way to diagnose the problem.) Either way, arthritis can develop as the dog ages. Dogs with hip dysplasia should not be bred — so if you're buying a puppy, ask the breeder for proof that the parents have been tested for hip dysplasia and are free of problems. Gastric Torsion: Also called bloat, this is a life-threatening condition that can affect large, deep-chested dogs. This is especially true if they are fed one large meal a day, eat rapidly, drink large volumes of water after eating, and exercise vigorously after eating. Bloat is more common among older dogs. GDV occurs when the stomach is distended with gas or air and then twists (torsion). The dog is unable to belch or vomit to rid himself of the excess air in the stomach, and the normal return of blood to the heart is impeded. Blood pressure drops and the dog goes into shock. Without immediate medical attention, the dog can die. Suspect bloat if your dog has a distended abdomen and is salivating excessively and retching without throwing up. He also may be restless, depressed, lethargic, and weak, with a rapid heart rate. It's important to get your dog to the vet as soon as possible if you see these signs. Cutaneous Mucinosis: Mucin is the substance in the skin that causes wrinkling. Clear and stringy, it acts like glue when a dog is wounded. Some Shar-Peis have an excess of mucin, however, which causes it to form clear bubbles on the skin that may rupture and ooze. It may be associated with allergies and is treated with steroid therapy. Glaucoma: Glaucoma is defined by an increased pressure in the eye, and can be found in two forms: primary, which is hereditary, and secondary, which is caused by decreased fluid in the eye due to other eye diseases. Symptoms include vision loss and pain, and treatment and prognosis vary depending on the type. Glaucoma is treated surgically or with eye drops. Entropion: This is the inward rolling of the eyelid, usually the lower one, and found in both eyes. 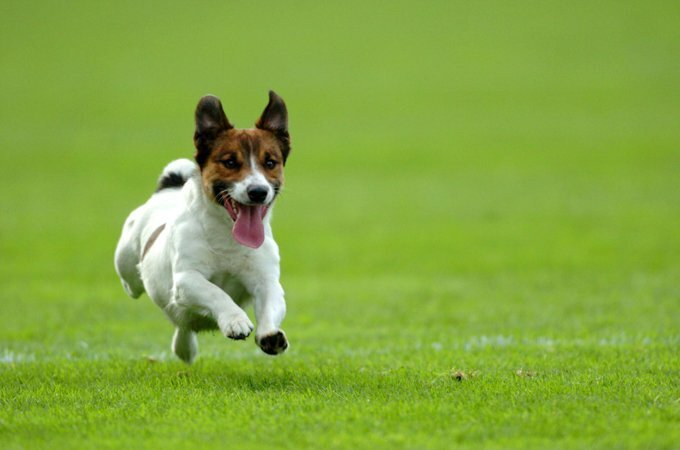 It causes vision loss and irritation, and generally occurs before a dog turns a year old. Corrective surgery when the dog reaches adulthood is an effective treatment. In Shar-Peis, you should expect to see health clearances from the Orthopedic Foundation for Animals (OFA) for hip dysplasia (with a score of fair or better), elbow dysplasia, hypothyroidism, and von Willebrand's disease; from Auburn University for thrombopathia; and from the Canine Eye Registry Foundation (CERF) certifying that eyes are normal. You can confirm health clearances by checking the OFA web site (offa.org). The Shar-Pei lives comfortably in the city or country. He does well in a limited space, such as an apartment or condo, as long as he gets daily exercise. A backyard is not required, but he does appreciate getting out and stretching his legs. In general, the Shar-Pei is fairly happy just hanging out with his owner, wherever he may be. Begin training and socializing your Sharpei the day you bring him home, and commit to continuing the process all his life. He'll need the constant reinforcement since he's not naturally friendly to other dogs. He can also be stubborn and owners must be consistent and firm in order to establish leadership. He is generally eager to please, though, and responsive to training. The best kind of socialization exercise is to take your Shar-Pei with you everywhere — to puppy classes, outdoor events, busy parks, friends' homes — and as often as possible. This will help prevent him from becoming overly shy or overprotective. Since this breed can be aggressive toward other dogs, the Shar-Pei should be kept leashed in public. 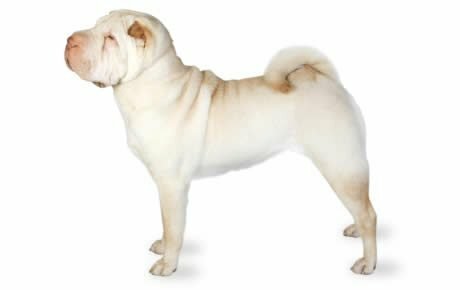 The Shar-Pei is classified as a short-nosed, or brachycephalic breed, similar to the Bulldog, Boxer, Pug. Their short noses make them highly sensitive to heat, which means they make lousy jogging companions. To prevent heat stroke, these dogs should be kept inside with fans or air conditioning in hot weather. Recommended daily amount: 1.5 to 2.5 cups of high-quality dry food a day, divided into two meals. For more on feeding your Shar-Pei, see our guidelines for buying the right food, feeding your puppy, and feeding your adult dog. A quintessential Shar-Pei characteristic second only to his wrinkles is his bristly coat. It stands straight up, like a 1950s butch-style hairdo, and varies in length, from a really short "horse" coat to a longer "brush" coat. You can find it in many colors, including solid black, cream, fawn, red, sable, and blue. He sheds minimally. While the Shar-Pei is a naturally clean dog with very little odor, he needs only a little grooming to keep him looking good. A thorough brushing once a week with a rubber curry or grooming mitt is sufficient to remove dead hair and dirt. He doesn't need to be bathed a lot, about every 12 weeks if he hasn't been rolling in the mud. Frequent baths tend to irritate his skin. Brushing and bathing are the easy parts of grooming the Shar-Pei. The difficult, but essential, part is getting him dry after a bath. If you don't dry the folds and wrinkles completely, you can expect a yeast or fungal infection. Wipe thoroughly between the folds with a dry towel to eliminate all moisture. Brush your Shar-Pei's teeth at least two or three times a week to remove tartar buildup and the bacteria that lurk inside it. Daily brushing is even better if you want to prevent gum disease and bad breath. His ears should be checked weekly for redness or a bad odor, which can indicate an infection. When you check your dog's ears, wipe them out with a cotton ball dampened with gentle, pH-balanced ear cleaner to help prevent infections. Be especially careful with the Shar-Pei's ears: the canals are small and are prone to irritation and infection. Do not use a swab to clean the ears and take care not to get water in them when bathing. Don't insert anything into the ear canal; just clean the outer ear. Begin getting your Shar-Pei used to being brushed and examined when he's a puppy. Handle his paws frequently — dogs are touchy about their feet — and look inside his mouth. Make grooming a positive experience filled with praise and rewards, and you'll lay the groundwork for easy veterinary exams and other handling when he's an adult. The Shar-Pei is a devoted family dog who is protective of his family, including children. To best teach him to get along with kids, he should be raised with them; if he doesn't live with them, he should be exposed to children as he grows up. Because he is such an independent breed, he's best suited to families with children 10 and older who know how to treat a pet respectfully. In order to provide the best chances for getting along with other dogs and animals, the Shar-Pei should be raised with them from an early age. Since he tends to be aggressive with other canines, supervision is essential. Shar-Peis are often acquired without any clear understanding of what goes into owning one. There are many Shar-Peis in need of adoption and or fostering, so consider contacting a rescue group before going to a breeder. Below are breed clubs, organizations, and associations where you can find additional information about the Chinese Shar-Pei. Chinese Shar-Pei Club of America, Inc.